Nearly two years ago I started to use a productivity system called ‘Autofocus‘, designed by Mark Forster of ‘Get Everything Done’ fame. though I used the system for a while, and a month later was still enthusiastic about the system, As frequently happens I stopped using it after a few months, and resorted again to trying to keep everything in my head. My new lecturing position is different to my previous one however, and whilst I do have some regular teaching, I also have intensive block weeks which require a lot of preparation, and also have distance learning students who I may not see face to face, but do have to regularly monitor. Because of this, it feels like I am ‘juggling’ my workload a lot more than previously. Clearly I needed to think again. I tried a simple to-do list but this didn’t work for me. So I’ve gone back to Autofocus, and writing down everything I need to do. It’s very early days yet, but at least at the end of the day I can turn around and say ‘this is what I’ve done’ – Five items off the list yesterday, and two today (three once I’ve completed this blog post). Why does Autofocus work for me? I like the idea that there’s no prioritisation, you do what you ‘feel like’ at the time. If you get bored with a task that’s OK too, you simply cross it off the list and add it to the bottom. At the end of a page, you look at what you need to carry forward and write it again, if you don’t feel the need to do it, then highlight it (to show it’s never been completed), and forget it. Mark Forster acknowledges that it’s no good for regular time-bound activities, but for anyone that has some degree of freedom in what they do, I can recommend it. You wait months for a posting, then two turn up at once. This is me flexing my techie muscles, a slightly rarer event than it used to be. It was nearly two years ago that I bought my Asus eee PC, and I’ve always had performance problems. I’ve fought against installing a linux designed for netbooks on it, though I have dallied with ‘live CD’ installations. So the poor eee remained unloved, only used occasionally by house guests. In November I decided to bite the bullet, and did a complete install of the Jolicloud OS onto the machine. The installation was a breeze, though I did have to drop to the command line for a couple of ‘sudo’ commands for a problem which isn’t worth reporting here, as since then the OS has been upgraded to 1.1, of which more below. My desktop is shown below. The PC will be connected to the Internet most of the time. As such, there is no differentiation between web-based applications (such as google docs), and ‘on machine’ applications (such as Skype). Automatic updating of all these applications is handled by Jolicloud automatically. Every so often you’ll see a twirling progress wheel, and as if by magic you have the new program/OS update. 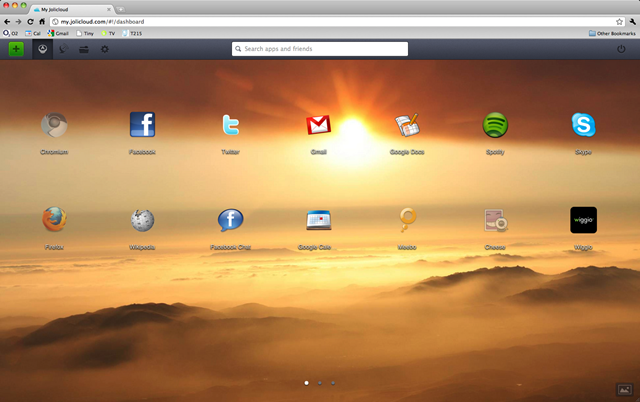 You can also access your desktop, and all of the ‘cloud’ applications via any ‘chrome’ browser. As I’ve connected to Jolicloud via my Facebook account, one click and I have my netbook’s desktop wherever I am. To be honest this is of limited use to me, but it is a handy feature to have. Today Jolicloud released Version 1.1 of the software, which promises performance improvement (though I was already really pleased with the performance, boot up to Internet access in less than a minute), improved battery life (that’ll be nice!) and generally improved front end. I wish I could include a screen shot, but the estimated 1.5 hour install process has so far taken 4.5 hours and is still going (the progress bar is moving, but very slowly). Jolicloud is now touting the new OS as the answer for a wide range of low-spec machines, including old machines and touch tablets, and have therefore developed a ‘cloud’ operating system months (or even years) before Google and their Chromium operating system. And if you want, you can even buy a Jolicloud-branded netbook (a Jolibook), though this still seems a little expensive, when you remember there’s no license costs. Once I’ve given OS 1.1 a go I will let you know how it compares to the previous incarnation, but you can download it now and try for yourself. Just a quick note to let everyone know that I’m back on this blog, and will start posting some new stuff real soon. It’s been a very busy couple of months, but I’m keen to re-activate this blog as I’ve moved into a new job within the university. I’ve also got a backlog of technical wizardry to share, as well as posts relating to my new role as a lecturer in Birmingham City Business School.